Whether you go for the food, the fun, the music or the people-watching, the Minnesota State Fair has something for everyone. There’s only one problem with The Great Minnesota Get-Together: sometimes the weather doesn’t cooperate. In fact, the hottest day at the fair on record was a whopping 104 degrees. To help you combat high temperatures and humidity, we’ve done some research that will help you stay cool at the Minnesota State Fair. Here are the top seven tips we’ve found. Staying hydrated is the best way to stay healthy and safe while walking around the fairgrounds. Drinking lots of non-alcoholic fluids will help you prevent dehydration and heat stroke while allowing your body to stay cool with sweat. You can buy bottled water at almost any concession stand at the Minnesota State Fair. You are also welcome to bring your own water bottle or drink out of the public water fountains that are located around the fairground. Water bottle refill stations are located in the Lee & Rose Warner Coliseum and progress center. While drinking water is important, going to the Minnesota State Fair is also a great time to try delicious new beverages. For instance, the Minnesota Honey Producers, located on the north side of the Agriculture Building, are serving a new honey cream soda float featuring Minnesota-grown honey ice cream. You can also try refreshing drinks like milkshakes from the dairy building or fresh-squeezed lemonade from various vendors. The best part about the Minnesota State Fair is arguably the food. 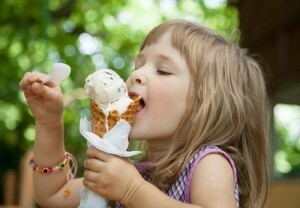 Eating cold foods can help you reduce your body temperature and stay cool on hot days. Some of our frozen favorites at the fair include bacon ice cream from Rainbow Ice Cream, smoked soft serve ice cream from Blue Moon Diner, and nitro cold press from the Minnesota Farmer’s Union Coffee Shop. What’s your favorite frozen treat at the Minnesota State Fair? Keeping your skin wet is a natural way to reduce your body temperature and resist overheating. A great way to get wet at the Minnesota State Fair is to visit and enjoy the water rides like the River Raft Ride or Ye Old Mill. The Minnesota State Fair has also installed misting stations around the fairgrounds that are designed to keep visitors cool in soaring temperatures. These stations are located near both medical aid tents (see our last tip) and other misting stations may be installed if the temperatures are anticipated to be high. Some buildings at the Minnesota State Fair are equipped with large fans that can provide a respite from the heat. Most of the livestock buildings, including the Miracle of Birth Center, are equipped with fans to keep the resident animals cool. There are also fans outside of the butterhead cases in the Dairy Building to help prevent condensation on the glass. This likely goes without saying, but dress for the weather before you head outside! Short sleeves, dresses, skirts, hats, and shorts can help keep you cool. For help cooling off, bring a handkerchief that you can douse in cold water and pat on your head and neck. Many fairgoers also bring or purchase personal fans and spray bottles to keep themselves cool. Most of the big attractions at the State Fair take place outside. Plus, you’ll spend a lot of the day walking place to place out on the streets. With so much time outside, you’ll need to look for some shade or sneak into one of the buildings for a break from the hot sun. If you’re hoping for air conditioning in one of the public buildings, you’ll have a tough time finding it as none of the public buildings have air conditioning. However, the Blue Flame Lodge across from the Giant Slide and next to K102 has air conditioning and ice-cold water. If it’s hot enough at the fair this year, you bet that we’ll seek it out! If you start experiencing symptoms like dizziness, nausea, rapid breathing and confused thinking, you may be experiencing heat stroke. Have someone help you over to the medical aid tents, which are air-conditioned and staffed with medical professionals who can help you. If you are on the west side of the fairgrounds, visit the medical aid tents across from the West End Market on West Dan Patch Ave. If you are closer to the east side of the fairgrounds, head to the medical aid tents outside the northwest corner of the 4-H building on Cosgrove Street. As the temperatures rise, you may need to get creative to stay cool at the fair. Enjoy a cool milkshake near the Moo Booth, bring a fan, and drink plenty of water to make sure you can enjoy the fair all day long. For more tips for staying cool during the hot Minneapolis summers, like the Ray N. Welter Heating Company on Facebook or follow us on Twitter!